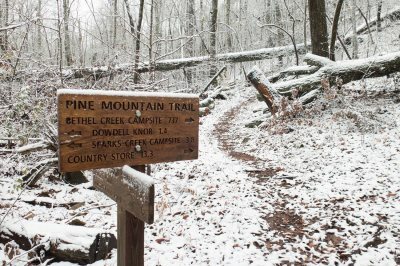 DAY HIKES: There are seven loops along the Pine Mountain Trail, all of which make good day hikes. Good idea to have trail map and ask for information at the Park Information center when you buy the map, or contact the PMTA. Make note of how a loop is formed (most use some of the blue blazed main PMT along with a named connector trail blazed in white. At intersections of connector trails and the main PMT there are wooden directions signs like the signs below. Note: There are some horse-only trails that intersect with the Pine Mountain trail. They are not on the PMT map so be aware of them in several places: near Mile 7, several places on the Sawtooth Trail, near Mile 18.5, Mile 19, Mile 19.5, and Mile 20.5. Horse trails are clearly marked with "no hiking" symbol stickers on RED strip signs and the PMT has brown strip signs with "no horses" at/near the intersections of the PMT and a horse trail. Overlook Loop: (3.4 miles) This loop is formed with the 2.1 mile Chestnut Oak Trail and 1.3 miles of the main PMT. You may begin at the Gardens Overlook Parking Area on Hwy 190, or at the beginning of the trail and park at the area across from Callaway Country Store. 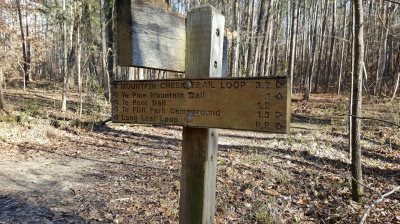 Mountain Creek Nature Trail: (3.2 miles) This red blazed loop trail starts at the Trading Post in main RV camping area near Lake Delano. Though less strenuous, it is also one of the prettiest as it passes through several plant habitats. 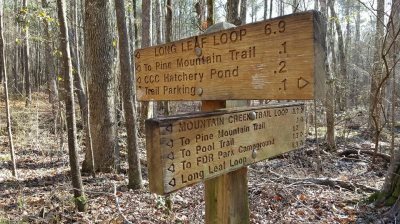 Longleaf Loop: (6.9 miles) This loop has the most trail connections and a map is highly recommended for hiking this loop. There are six highway crossings and one on the campground road for a total of seven paved road crossings. Also it has at least five trail connections that you must make. Most hikers use the Park Office or Fox Den Cove Parking Lot as a starting point for hiking this loop. Big Poplar Loop: (7.8 miles) This is the longest loop and is named for the large poplar tree located close to mile marker ten. It is formed with the 2.7 mile Sawtooth Trail and 5.1 miles of the main Pine Mountain Trail. It also has a number of rock formations and springs and creeks to cross. It has two entry points on Highway 190, one at mile six at the Fox Den Cove parking area and the other near mile eleven at the Mollyhugger Hill parking area. Dowdell's Knob Loop: (4.3 miles) This loop is formed with the 1.3 mile Boot Top Trail and 3 miles of the main Pine Mountain Trail. It can best be accessed by parking at the Dowdell Knob Trailhead Parking Area (which is 1.3 miles south off Ga 190). The main, blue-blazed trail can be reached via a 400' connecting trail leading away from the trailhead shelter. 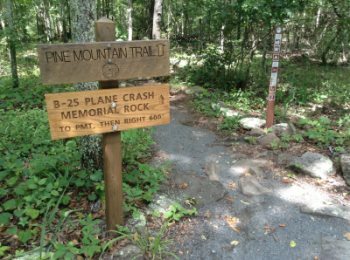 Once you reach the main blue blazed Pine Mountain Trail, if you go right (west) about a mile or to the left (east) about 2 miles you will see signs to connect to the white-blazed Boot Top Trail for some 1.3 miles. 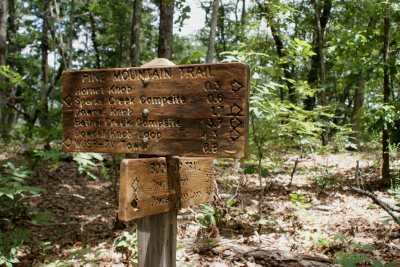 Hiking in either direction from the connecting trail from Dowdell's Knob will bring you back to the trailhead access trail at Dowdell's Knob. The Boot Top Trail crosses the road leading to Dowdell's Knob. NOTE: The gate to Dowdell's Knob off HWY 190 closes 5:00 PM October 1 to March 31 and at 8:00 PM April 1 to September 30. Backpackers can leave their vehicles overnight, with a backcountry permit on the dash, at the Dowdell Knob Trailhead Parking Lot. NOTE: The April 2011 tornado impacted the area west of Mile 14 (for 4,485 feet) and east of Mile 15 (3,800 feet). The trail sides are showing lots of new growth in these areas. NOTE: It is very important for hikers to understand that to make the loop they must connect up with the white blazed Boot Top Trail correctly. Study the map, and watch for wooden directional signs at the Boot Top Trail intersections. Wolf Den Loop: (6.7 miles) For a detailed description of a hike to Cascade Falls and back, Wolfden Loop and the East End Loop click here to see a PDF file. This is considered one of the most beautiful stretches of trail in the Southeast and is the most popular section of Pine Mountain Trail system. The Wolf Den Loop is formed with the 1.7 mile Beaver Pond Trail and 5 miles of the main PMT. There are two trailhead entry points to this loop. One is at the parking lot near the WJSP-TV tower on Alt US 85W just north of Ga. 190 and the other on Ga. 190 at Rocky Point Parking Lot (noted on the PMT map as near Mile 18.) Thus you can hike the loop from either point and suggested is hiking the loop clockwise. Cascade Falls and the Wolfden area: Don't want to hike the whole 6.7 mile loop? Do just do what we call an "out and back" hike from the WJSP-TV Tower Parking Lot to the falls area. It is about 2.1 miles or just over an hours hike to Cascade Falls. You'll cross over water 13 times on the way (using stepping stones at most crossings along with 6 bridges.) Take a break at Cascade Falls, hike up to the top of the Wolf Den cave cliff (carefully) by following the main trail west then ease to the top of the cliff. It is highly suggested NOT to climb onto the top of the waterfalls as it is quite slippery. It is ok to wade in the pool, but caution there due to rocks in the bottom. Lots of native plants and trees along the way to Cascade Falls. This is a great hike year round. 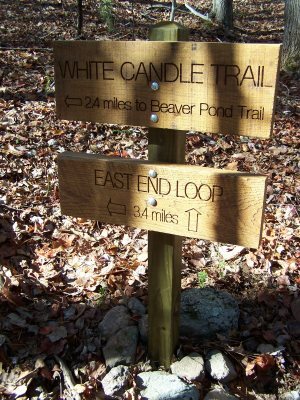 The 2.4 mile White Candle Trail is connected at each end with 1 mile of the 1.7 mile(total) Beaver Pond Trail to form the 3.4 mile loop. Starting from Rocky Point Parking Lot on GA 190 near trail Mile 18. Enter the trail on the left end of the parking area by the green self-pay parking permit box and go up the hill a short distance past the Mile 18 marker to the PMT/Beaver Pond Trail intersection. Hike left (east) along the Beaver Pond trail just under ½ mile to the intersection with the White Candle Trail. 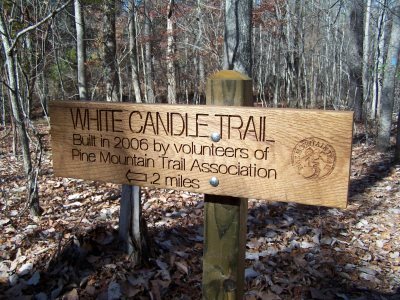 You may, chose to continue straight on the White Candle trail to hike the loop counter-clockwise OR turn left onto Beaver Pond Trail, crossing GA 190 shortly and continuing in a clockwise direction. Note: Hiking to/from the Rocky Point parking lot, will add just over 1 mile to the total loop hike. Starting from here is a slightly shorter total distance overall. Simply walk the PMT from the map kiosk approximately 100 yards and turn LEFT onto the Beaver Pond Trail + another 0.2 mile to the White Candle/Beaver Pond Trail intersection. Left/west from there on the White Candle Trail, you will cross GA 190 and following the White Candle Trail back to the Beaver Pond Trail. 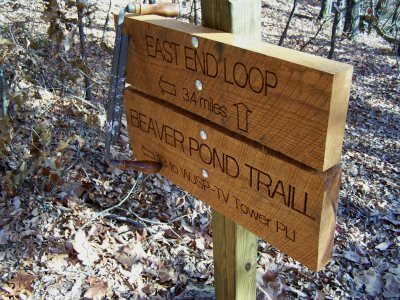 Turn right uphill (east) and you cross GA 190 once more, where you can return along the Beaver Pond Trail to its’ end then right again a short way to the Mile 23/WJSP TV Tower Trailhead and Parking Lot to complete your hike. Please bag and pack out your trash. Currently the only trash containers along the trail are at the Dowdell Knob Trailhead and the WJSP-TV tower Parking Lot trailhead. Please leave the trail even better than you found it by picking up litter left by someone less thoughtful than yourself.